The recent election of former soccer player Ahmed Eid Alharbi as the first freely chosen head of the Saudi Football Federation (SFF) in a country that views polling as an alien Western concept masks regional fears of the impact of popular revolts that have swept the Middle East and North Africa. It also constitutes the first time that autocratic rulers have sought to reduce their identification with soccer in a break with a tradition that employs the beautiful game in a bid to polish their tarnished images. “Words such as freedom of choice, equality, human rights, rational thinking, democracy and elections, are terms we came to view with high concern and suspicion. We treat them as alien ideas that are trying to sneak within our society from the outside world. But last week an amazing and irregular event took place, in one of our sporting landmarks. The members of the General Assembly of the Saudi Arabian Football Federation (SAFF) have elected through popular voting, their first president,” wrote columnist Mohammed AlSaif in the Arab News. Mr. Alharbi, a former goalkeeper of Al Ahli SC, the soccer team of the Red Sea port of Jeddah, who is widely seen as a reformer and proponent of women’s soccer in a country where women are fighting to gain the right to play football, narrowly won the election widely covered by Saudi media to become the Saudi federation’s first ever elected leader. “Saudis were witnessing for the very first time in their lives a government official being elected through what they used to consider as a western ballot system. People eagerly followed a televised presidential debate between the two candidates the previous day,” Mr. AlSaif wrote. The election took place at a time in which the need for political in addition to economic reform is increasingly being openly debated in the kingdom while the government is cracking down hard on its critics. With unrest simmering among the predominantly Shiite population of Saudi Arabia’s oil-rich Eastern Province as well as among the families of political prisoners, the government has sought to fend off popular protest with a $130 billion program to shore up public services such as housing and create employment, particularly in the security sector. In a commentary in Arab News, columnist Khaled al-Dakheel warned that economic reform and addressing social needs should “be followed by other steps of reform dealing with political issues, such as elections, representation, the separation of powers, activation of the Allegiance Commission, freedom of expression, the independence of the judiciary, and making all people equal before the law, etc. The necessity of political and constitutional reform is due to the fact that the positive impact in people’s economic reforms, especially financial, is usually temporary because of the variable nature of their economic and social circumstances,” Mr. Al-Dakheel said. The writer laid out a program for political and constitutional reform in a country that identifies the Quran as its constitution. Mr. Al-Dakheel’s program included an overhaul of the country’s bloated bureaucracy; ensuring that the longevity of long-serving officials, many of whom are members of the royal family, is based on merit rather than position, expansion of the powers of the country’s toothless Shoura or Advisory Council to gradually transform it into an elected legislature authority; tackling issues of unemployment, foreign workers’ rights and corruption; and diversification of the economy. In the meantime, authorities this week arrested prominent writer and critic Turki al-Hamad for criticizing Islamists in a series of tweets and calling for reform. Mr. Al-Hamad charges that the Islamists “have distracted us with nonsense that we forgot the important issues, compared Islamism to Nazism and effectively called for reform of Islam. “Our Prophet has come to rectify the faith of Abraham, and now is a time when we need someone to rectify the faith of Mohammed,” Mr. Al-Hamad tweeted. Activist and website designer Raif Badawi was arrested in June and is on trial for violating Islamic values, breaking Sharia law, blasphemy and mocking religious symbols on the internet. Mr. Badawi allegedly insulted Islam by allowing debate on his website, Free Saudi Liberals, about the difference between popular and political Islam. Fan pressure forced Prince Nawaf bin Feisal earlier this to resign as head of the SFF following Australia's defeat of the kingdom in a 2014 World Cup qualifier. His resignation broke the mold in a nation governed as an absolute monarchy and a region that sees control of soccer as a key tool in preventing the pitch from becoming a venue for anti-government protests, distracting attention from widespread grievances and manipulating national emotions. It also marked the first time that a member of the ruling elite saw association with a national team's failure as a risk to be avoided rather than one best dealt with by firing the coach or in extreme cases like Saddam Hussein's Iraq or Moammar Qaddafi's Libya brutally punishing players. Throughout the Middle East and North Africa, autocratic leaders have associated themselves with soccer, the only institution in pre-revolt countries that traditionally evokes the same deep-seated passion as religion, in a bid to polish their tarnished image. Prince Nawaf’s resignation constitutes the first time, an autocratic regime seeks to put the beautiful game at arm’s length while maintaining control because of the Saudi national team’s poor performance. Saudi Arabia has dropped to the 126th place in the ranking of world soccer body FIFA. The kingdom’s ruling Al Saud family retained its grip on sports however with Prince Nawaf staying on as head of the Saudi Olympic Committee and the senior official responsible for youth welfare on which the SFF depends alongside television broadcast rights for funding. Major soccer clubs moreover continue to be the playground of princes who at times micro manage matches by phoning mid-game their team's coaches with instructions which players to replace. In addition, sports remains a male prerogative in the arch conservative kingdom. Saudi Arabia underlined its lack of intention to develop women’s sports by last year engaging Spanish consultants to develop its first ever national sports plan -- for men only. Supporters of Syrian president Bashar al-Assad portrayed this weekend’s winning of the West Asian soccer championship by defeating Iraq as a unifying, national achievement against all odds. Yet, Syria’s success 22 months into an increasingly brutal civil war hardly constitutes the equivalent of Iraq’s winning of the Asian Cup in 2007 at the peak of that country’s sectarian violence. The Syrian national team, unlike its Iraqi counterpart five years ago, is moreover incapable of offering Syrians any hope of an end to the bloodshed and greater unity. "I give this win and this worthy title to the Syrian people. I thank God that we succeeded in bringing happiness to the sad people," said Syrian striker Omar Al Soma in a televised interview after the match. Syrian state-run television, responding to news reports of a power cut in Damascus, charged that "even football has not escaped the bloodthirsty media, who tried to ruin the joy of our people after the victory by broadcasting false information about a general power cut in Damascus, and about clashes." Opponents of Mr. Assad sought to diminish the symbolism of the Syrian victory. "The team's victory has nothing to do either with the president or with the rebels," said satiric Facebook page Shu Ismu? or What is his name? "It is thanks to the 11 players who played and won this victory for all the country. All the players are Syrian. Some are pro-regime, some are anti-regime, and some are neutral," the page said. Abu Bilal, an activist in Homs, Syria’s battered third largest city and home to Abdelbasset Saroot, a crooning national youth team goalkeeper, who has emerged in the last two years as a leader of the local resistance, charged that Syrian forces intensified their shelling of rebel-held parts of the city after the match’s final whistle in Kuwait. "They rained down bombs on Old Homs," he said. More fundamentally, any comparison to Iraq’s 2007 victory is forced at best. A dramatic penalty shoot-out with South Korea secured Iraq a place in the Asian Cup final. Cheering fans in Baghdad paid the price. A suicide bomber and celebratory gunfire killed 50. The team met to discuss quitting. But after watching a news report where a bereaved woman, hysterical after her son's death, begged them to continue in the memory of her child they only had one choice. Fate would produce the just result, they predicted, and indeed it did. In a soccer fairy tale, Iraq emerged against Saudi Arabia the winner of the Asian Cup. To win the game, a Kurdish player passed the ball to a Sunni, who scored the decisive goal. Meanwhile a Shiite goalkeeper held the opposing team scoreless to secure the victory. The teamwork was at the time Iraqis’ only source of hope for a life beyond conflict in a war-ravaged country devoid of good news and inclusive institutions, a mirage of religious and ethnic harmony. Iraqi national team players truly felt that they were playing for their nation rather than for an autocratic leader who celebrated their achievements for his own political benefit. Despite the sectarian violence Iraqis had put neo-patriachism, the phrase coined by Palestinian-American scholar Hisham Shirabi, behind them. By contrast, Syrian players fall into two categories: those that have internalized the neo-patriarchic notion of the autocratic leader as a father figure and those that haven’t defected out of fear for the safety of their families even if the war has reduced Syrian soccer to a shadow of itself. Stadiums in this soccer-crazy country are empty and frequently used as staging posts for pro-Assad forces or detention centers. Largely suspended, the Syrian league has been reduced to four teams, two of which dropped out in the 2010/2011 championship. That pitted Syria’s two historically strongest team Al Jaish (The Army) against its police counterpart, Al Shurta (The Police), who represented the regime’s grip on the sport. Al Jaish was for the longest time virtually synonymous with the national team. National service was crucial to Al Jaish’s success. The moment a talented young player came of age, the army conscripted him and he played for Al Jaish. By sucking up the league's talent they won honors and attracted huge crowds for years, while other clubs had to keep a lid on their discontent. 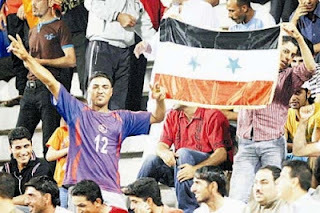 Similarly, the shabiha, the irregular, civilian-clad, armed groups blamed for many of the atrocities believed to have been committed by forces loyal to Mr. Assad also trace their roots to soccer. In an account of the history of the shabiha, whose designation derives from the Arabic word for ghost, Syria expert Joshua Landis’ Syrian Comment blog, traces their origins to members of the Assad family as well as young, desolate Alawites in northern Syria who saw their escape from poverty and humiliation in becoming wealthy and prestigious on the back of smuggling of banned luxury goods from Lebanon and involvement in soccer. While the term shabiha has come to mean thugs rather than ghosts, the associated verb, shabaha, describes a goalkeeper, a shabih, jumping into the air or going airborne to stop an opponent’s attack, according to Syrian Comment. The shabih jumps and saves whether he was the soccer goalkeeper or the smuggler who enabled his clients to jump in status with the goods he provided. Fawwaz al-Assad, a cousin of Bashar’s, widely viewed as the original shabih who rose to control the lucrative port of Latakia and its adjacent smuggling route, started as a fervent supporter of the city’s Tishreen soccer team before becoming its president. Syrian Comment recalls Fawwaz driving in “his big Mercedes” a demonstrative loop around the Al-Assad stadium before sitting on a chair in a fenced off area track reserved for players and coaches to watch a match. Strife in Syria has meanwhile forced some 50 players and coaches into exile. Lulu Shanku, a former national team player returned to his Swedish premier league team Syrianska disgusted with the corruption in Syrian soccer and the intimidation of players by the Assad regime. In some ways, he may have jumped from the fire into the frying pan, illustrating the importance Arab autocrats attribute to soccer even when it is played beyond the Middle East and North Africa. Power within Shanku’s team rests with an Assyrian exile who served on Syrianska’s board and now is its unelected head of security. A mechanic and failed gas station owner who unabashedly defends Mr. Assad, he is believed to have ties to Syrian intelligence and local crime groups. For decades soccer has constituted an alternative public space in the Middle East. Largely unnoticed by international experts, soccer provided a venue for the expression of pent-up anger and frustration against authoritarianism. By the time the Arab revolt erupted in December 2010, soccer had emerged as a key nonreligious, nongovernmental institution capable of confronting repressive regimes. Nowhere was this more pronounced than in Egypt, where militant, politicized, often violent ultras—organized clubs of soccer fans—played a key role in the protests that forced President Hosni Mubarak to resign in February 2011. Since his resignation, Egyptian ultras have continued to play a prominent role in Egyptian street politics. The ultras of the Middle East—organized clubs of soccer fans—are renowned for their fanatical support of their teams. With elaborate displays of fireworks, flares, smoke guns, loud chanting, and jumping up and down during matches, they hope to create an atmosphere in the stadium that encourages their team and intimidates opposing players and supporters. Like many of their counterparts in Europe and elsewhere, the ultras are fiercely independent, with bans on outside funding, and abide by strict rules that oblige them to attend their team’s every match. As in many countries, Middle Eastern ultras are composed largely of young working- class men who embrace a culture of confrontation—against opposing teams, against the state, and against expressions of weakness in society at large. Sometimes this culture manifests itself in acts of political rebellion (Kuhn 2011). * There are too many people I am indebted to for sharing their knowledge, wisdom, help, and support—many of whom prefer not to be named. First and foremost however, I will never be able to repay Teresita Cruz-Del Rosario for her insights, guidance and unwavering support in more ways than I can describe. I am also grateful for the con- fidence, backing and encouragement I received from my RSIS colleagues Barry Desker, Joseph Liow Ching Yong and Mushahid Ali as well as from Bilahari Kausikan. Without Steven Solomon’s comments, I would have never turned an incidental article into a systematic approach toward the Middle East and North Africa..
† James M. Dorsey is a senior fellow at the S. Rajmaratan School of International Studies at Nanyang Technological University in Singapore and author of the blog, “The Turbulent World of Middle East Soccer.” Please direct all cor- respondence to jmdorsey@questfze.com. flares, fireworks and banners into a stadium (Dorsey 2011). In recent years, violent clashes erupted almost weekly. Sudan—and a mob in Cairo stormed Algeria’s embassy (Fraser 2009). Mubarak’s government recalled its ambassador from Algiers. In retaliation, Algeria slapped Egyptian- owned Orascom Telecom’s Algerian operation with a tax bill of more than half a billion dollars. The feud might have escalated further if not for mediation by Libyan leader Mu’ammar Qaddafi (Personal interview with Egyptian soccer analyst Hani Mokhtar, (January 5, 2011, Lima). Qaddafi was not above associating himself with soccer as well. He adorned the country’s stadiums with quotes from his Green Book that explained his idiosyncratic theories of democracy, including the notion that both weapons and sports belong to the people. He appointed his son Al-Saadi—commander of a Libyan military unit that later played a crucial role in his father’s failed fight for survival in 2011—head of the Libyan Football Federation. Al-Saadi placed himself in the starting lineup of the Ahly club of Tripoli and pursued a stormy rivalry with the Ahly club of Benghazi, the country’s second-largest city, which later led the revolt against Qaddafi. In 2000, he had the Benghazi team relegated to the league’s second division, its headquarters burnt to the ground, and several of its officials imprisoned for protesting blatantly rigged matches (Dorsey 2011b). In Iran, as well, soccer pitches are political battlefields. Iranian President Mahmoud Ahmadinejad, a former soccer player, sought to associate himself with Iran’s national team in a bid to curry popular favor, though with limited success. He invited media coverage when he practiced occasionally with the team, and he got the team suspended from international play for his political interference in team management. This involvement backfired further in 2009, just before presidential elections that sparked nation-wide protest, when Ahmadinejad “was accused of ‘jinxing’ the team, which suffered a last-minute defeat to Saudi Arabia just after Ahmadinejad entered the stadium,” according to a U.S. State Department memo disclosed by Wikileaks (US State Department 2009). The first uprising in the region erupted in Tunisia in December 2010, after the self- immolation of Mohamed Bouazizi in the town of Sidi Bouzid. Observers have noted that this was not the first time that Tunisians had protested against the authoritarian regime of Zine El Abidine Ben Ali. Recent years had witnessed strikes, demonstrations, even other instances of self-immolation. In November 2010, weeks before the uprising, Tunisian soccer fans clashed with security forces after a tense championship match between Esperance Sportive du Tunis and TP Mazembe from the Democratic Republic of Congo. of Takriz formed the protestors’ fighting core (Pollock 2011). In Egypt, as well, some fervent fans of the top clubs had become politicized as well. “I made my first steps into politics in 2000,” said Mohamed Gamal Besheer, author of Kitab al- Ultras (The Ultras Book), who is widely seen as the godfather of the Egyptian ultras move- ment (personal interview with Mohamed Gamal Basheer, April 1, 2011, Cairo). “I was against corruption and the regime and for human rights. Radical anarchism was my creed. Ultras ignore the system. You do your own system because you already own the game. We see ourselves as organizers of anarchy. Our power was focused on organizing our system.” Some ultras made contact with like-minded militant fan groups in Serbia, Italy, Russia, and Argentina, developing friendships and in a few instances even long-distance relationships. Ahmed Fondu, a co-founder of one of the Egyptian ultras, was drawn into the movement in this way. “Soccer is a way of life for me. I made my transition to the ultras on the Internet. I encountered the fans movement. They were about bringing the game back to the fans. I talked to them every day for three or four years, and I’d check the newspapers every day,” said Fondu, who met his Serbian girlfriend through his connections with Belgrade ultras (Personal interview with Ahmed Fondu, April 2, 2011, Cairo). At the same time, the Egyptian ultras refrained from adopting the right-wing ideology of some of their counterparts overseas, or the nihilistic violence common to European soccer hooligans. “We are normal people. We love our country, our club and our group. We are fighting for freedom. That was the common thing between the revolutionaries and the ultras. We were fighting for freedom in the stadiums. The Egyptian people were fighting for freedom. We invested our ideas and feelings in revolution,” Fondu said. political organizations, but that their members were free as individuals to participate in the protests. “The group emphasizes that its members are free in their political choices,” said the statement by the Ultras Ahlawy, supporters of the Ahly club. Privately, both groups told their followers that the demonstration was what they had been working towards in four years of almost weekly clashes with security forces in the stadiums of Cairo. The ultras, unlike most other groups in Tahrir Square, were braced for violent confrontations. “We fought for our rights in the stadium for four years. That prepared us for this day. We told our people that this was our litmus test. Failure was not an option,” said Fondu. On January 25, Mohammed Hassan, a soft-spoken, 20-year old computer science student, aspiring photographer, and a leader of the Ultras White Knights, led a march from the Cairo neighborhood of Shubra that grew to 10,000 people. They marched through seven security barricades to Tahrir Square. A group of White Knights, including Mohamed, sought at one point to break through a police barrier to reach the nearby parliament building. “When I see the security forces, I go crazy. I will kill you or I will be killed. The ultras killed my fear. I learnt the meaning of brotherhood and got the courage of the stadium,” he said. He pointed to a scar on the left side of his forehead from a stone thrown by police, who stymied the fans’ first attempt to break through to parliament. As blood streamed down his face, he regained his courage from the crowd behind him: “They are our brothers. We can do this” (personal interview with Mohamed Hassan, April 1, 2011, Cairo). The ultras’ street-battle experience helped other protesters break down barriers of fear that had kept them from confronting the regime in the past. "We were in the front line. When the police attacked we encouraged people. We told them not to run or be afraid. We started firing flares. People took courage and joined us, they know that we understand injustice and liked the fact that we fight the devil,” said Hassan. medic or media contact. The ultras patrolled the perimeters of the square and controlled entry. They manned the front lines in clashes with security forces and pro-government supporters. Their faces were frequently covered so that the police, who had warned them by phone to stay away from Tahrir Square, would not recognize them. Years of confrontation with security forces prepared them for the struggle for control of the square when the president’s loyalists employed brute force in a bid to dislodge them. The ultras’ battle order included designated rock hurlers, specialists in turning over and torching vehicles for defensive purposes, and a quartermaster crew delivering projectiles like clockwork on cardboard platters. Khaliq Sarwat Pasha, co-founded Al-Ahly before becoming prime minister in 1922 (Personal interview with Adel Abdel Ghafar, April 23, 2012, Canberra). The shared experience of protest since early 2011, battling shoulder to shoulder against security forces, has altered relations between Cairo’s two groups of ultras, even if it has not erased their deep-seated rivalry. In January 2012, the White Knights called for a truce with the Ahlawy, in advance of a match between their two teams. “We are asking for an end to the bloodshed, and to reconcile and unite for the sake of Egypt,” the statement said. The Ultras Ahlawy replied with a smiley-face icon (Dorsey 2012b). In the months after Mubarak’s resignation, Egyptian security forces were reluctant to confront the ultras, in the streets or in stadiums, out of concern that clashes would undermine the military’s efforts to repair its tarnished image. That truce ended in September 2011, when Ahlawy ultras shouted obscene slogans against Mubarak and his former interior minister during an Egypt Cup match between Al-Ahly and Kima Aswan. Both men are on trial for their alleged role in hundreds of deaths during the anti-government protests that led to Mubarak’s ouster. In the ensuing clash, 130 people were wounded, including 45 policemen, and 20 ultras were arrested. Several days later, Ahlawy and Zamalek ultras joined together in large demonstrations demanding an end to military rule. Again in November 2011, ultras joined protestors who retook Tahrir Square from security forces, in clashes that left 50 dead and thousands injured. In February 2012, security forces stood by during a brawl after a soccer match in Port Said, Egypt, that left 74 Ahlawy ultras dead. Egypt’s two top soccer competitions, the Premier League and the Egypt Cup, were canceled this year because of concerns over violence. Elsewhere in the region, soccer has been suspended for months at a time, from the moment that anti-government protesters took to the streets. In Syria, the indefinite suspension of professional soccer since early 2011 has pushed anti-government protesters, including soccer fans, back into the mosque. With soccer stadiums inaccessible, serving as detention centers and staging points for security forces, protests have been more likely to start at mosques, the only remaining place where people can gather in numbers. In Algeria, where revolt petered out, at least for now, the regime and soccer fans have reached an informal understanding under which the militants returned to the stadium, where they are allowed to chant their slogans against President Abdelaziz Bouteflika, the military, corruption, and the cost of living. These arrangements constitute a fragile stand-off between protesters and the regime, which worries that anti-government agitation could spill out of the stadiums into the streets (Dorsey 2011c). 60 people, including nine security officials, have since been prosecuted for the deaths in Port Said. During the trial, the ultras staged a sit-in outside of the Egyptian parliament building, meeting formally with one another for the first time in their history and warning Egypt’s ae swiftly brought to justice. They also warned that they would resist a crackdown on militant soccer groups. In their first-ever joint statement, the two groups demanded “full transparency in revealing the outcome of the investigations. We will neither accept dis- regarding the disaster and turning it into football riots nor making a scapegoat to protect those who orchestrated the attacks.” They threatened joint action that would “not allow any football activities to resume unless complete justice is done” (Dorsey 2012b). In a sign of the shifting balance of power in the region, the ultras faced not only a challenge from the security forces. They also faced a challenge from women activists. Women had been active in all aspects of the Egyptian uprising, and they expected to join the latest protests as well. However, the ultras did not consider it appropriate for women to stay at the sit-in with men overnight, and women were forced to leave at 10:00 P.M. The Independent Egyptian Women's Union objected, “From our belief . . . that anyone who carries the flame of liberty against the oppressive powers, should respect it first, we announce our objection to the rules of the sit-in to ban women from being there after 10 p.m. and prohibit them from their right to protest (Ammar 2012).” The ultras were not affiliated with Islamist parties, or any other parties, but many of them shared the conservative social mores of the Islamists (Personal interviews with 20 ultras, March 30-April 2, 2011 Cairo). The masculine values that allowed the ultras to confront the security forces, such as courage and honor, coincided with patriarchal visions of male protectiveness of women, frequent separation of men’s and women’s spaces, and women’s duty not to provoke male lust. The ultras’ attitude towards women’s rights constituted the flip side of the exploitation of soccer’s patriarchal values by the Middle East and North Africa’s neo-patriarchal regimes. Dictatorial regimes were not simply superimposed on societies gasping for freedom. Arab autocracies may have lacked popular support and credibility but the repressive reflexes that created barriers of fear were internalized and reproduced at every layer of society. As a result, societal resistance to, and fear of, change contributed to their sustainability. The patriarchal values that dominate soccer, in addition to its popularity, made it the perfect game for neo- patriarchs. Their values reinforced society’s cultural patriarchy as well as soccer’s values: assertion of male superiority in most aspects of life, control or harnessing of female lust and a belief in a masculine God. The protesters, despite their revolutionary spirit, were often unable or unwilling to completely shake off the patriarchal values they internalized. That failure complicated their struggle to not only topple the autocratic father figure, but to also destroy the regime he established. This regime was manifested, for example, in the street clashes near Cairo’s Tahrir Square in November 2011 during protests demanding an end to the Egyptian military’s rule. “The worst and the most damaging form of the persistence of the ancien regime is when it persists in the very lives, behaviour, habits and decisions of the revolutionaries themselves,” says prominent Syrian intellectual Sadik Al Azm (Al Azm 2011). All in all, soccer remains a battlefield as well as a prism from which to view social and political dynamics not only in those Middle Eastern and North African nations still governed by autocratic leaders, but also those that have toppled their presidents in the course of the Arab revolts. Militant soccer fans continue to be at the forefront of efforts to ensure that the goals of popular revolts are achieved, or to maintain pressure on governments in countries like Algeria where discontent is boiling just under the surface. The soccer pitch is also, more than ever, a key venue in the Palestinian and Kurdish struggle for nationhood, the assertion of Berber and Iranian Azeri identity, and the fight for women’s rights. race, and sexuality. As a result, sports in general and soccer in particular have a history of resistance (Gates 2007). In doing so, sports have frequently forced those that have a grip on the levers of power to adapt their modes of control. African-American athletes formed their own teams and leagues in response to their exclusion from participation in mainstream sports for almost a century after the abolition of slavery as a lever to achieve inclusion. As recently as the 1990s, American athletes and coaches, irrespective of color, boycotted sport events in protest against the perceived racism of sponsors. These efforts to get antiracism standards accepted were ultimately successful. Similarly, observant Muslim women, backed by an Arab vice president of the world soccer body FIFA and Western sports figures, in 2012 persuaded the International Football Association Board (IFAB) to lift the ban on women wearing culturally acceptable headdress. Following the example of African-Americans, women in Saudi Arabia, where women’s sports linger in a cultural and legal no-man’s land, have formed their own clubs and teams that operate in a grey zone. Kurds and Palestinians see international soccer matches as a way to project their nationhood and achieve statehood. In doing so, athletes, managers and officials employ soccer as a driver for social transformation. For most of the past decade soccer in the Middle East and North Africa has been about more than just the game. This will likely be the case in coming decades. School of Economics and Political Science. November 30. Ammar, Manar. 2012. “Egyptian Women Object to the Ultras’ Sit-In Rules.” Retrieved April 8, 2012 (BikyaMasr.com). Beshir, Mohamed Gamal Basheer. 2011. Kitab al-Ultras. Cairo Dar Dawn. Middle East Soccer. February 3. Retrieved October 2012 (mideastsoccer.blogspot.sg/2011/02/soc cer-fans-key-to-imminent-cairo.html). ———. 2011b. “Football Pitches: A Battleground for North Africa's Future.” The Turbulent World of Middle East Soccer. March 24. Retrieved October 2012 (mideastsoccer.blogspot.sg/2011/03/foot ball-pitches-battleground-for-north.html). Middle East Soccer. October 14. Retrieved October 2012 (mideastsoccer.blogspot.sg/2011/10/alg erian -stadiums-hotbeds-of-anti.html). ———. 2012b. “Rival Egyptian Ultras Warn Egypt’s Military Rulers in Rare Show of Unity.” The Turbulent World of Middle East Soccer. March 14. Retrieved October 2012 (mideastsoccer. blogspot.sg/2012/03/rival-egyptian-ultras-warn-egypts.html). Egypt News. 2012. March 15. El-Sayed, Mohamed. 2004. “Love at First Sight.” Al-Ahram Weekly. Gleeson, Mark. 2008. “Cairo Derby Divides an Entire Nation.” Reuters, March 11. New York Times, February 13. Kuhn, Gabriel. 2011. Soccer vs. the State: Tackling Football and Radical Politics. Oakland, CA: PM Press. Montague, James. 2008. “The World’s Most Violent Derby: Al Ahly v Zamalek.” The Guardian, July 18. US State Department, Dubai. 2009. “Iran’s First Fan: Dissatisfaction with Ahmadinejad May Extend from the Soccer Pitch to the Ballot Box.” June 9. Retrieved October 2012 (wikileaksupdates. blogspot.sg/2010/12/irans-first-fan-dissatisfaction-with. html).